Like most whiskeys, Jameson also has a rich history dating back to 1780 when John Jameson opened a whiskey factory in Dublin. Over the years, this production has grown in Ireland, and today it is headquartered in Middleton. Today, Jameson is the fastest growing premium brand in the world and Kontra Agency is proud to be working with such renowned brand with long history and core values. Our task was to create a functioning and modern landing page. Primary role was that it serves as a sign-up form for Jameson Factory event. Whoever wanted to come, had to apply by answering a couple of questions, along with basic info about each individual such as name, age, gender etc. To make it more interesting, we created it in a form of a job application at Jameson Factory which was also the theme of the event itself. First and foremost, landing page had an age restriction which means one had to put in their birth date before having access to the page. No underage persons were allowed. 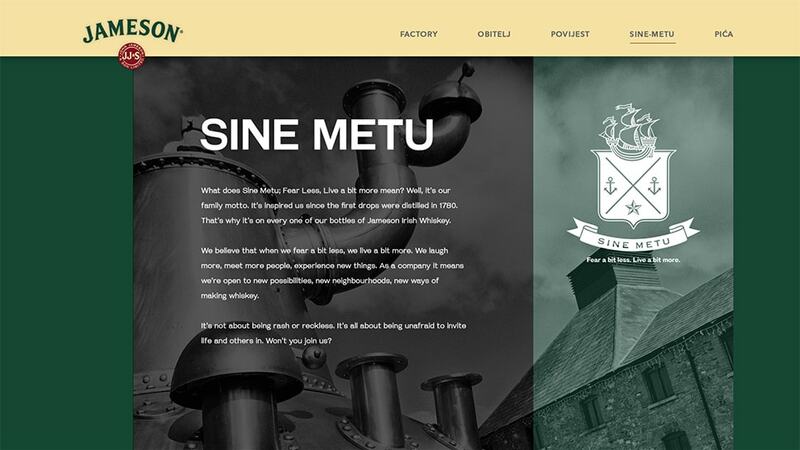 The Landing page also contained various tabs with history of Jameson family and their distillery, Jameson drinks and their specialties, story of Sine Metu motto etc. 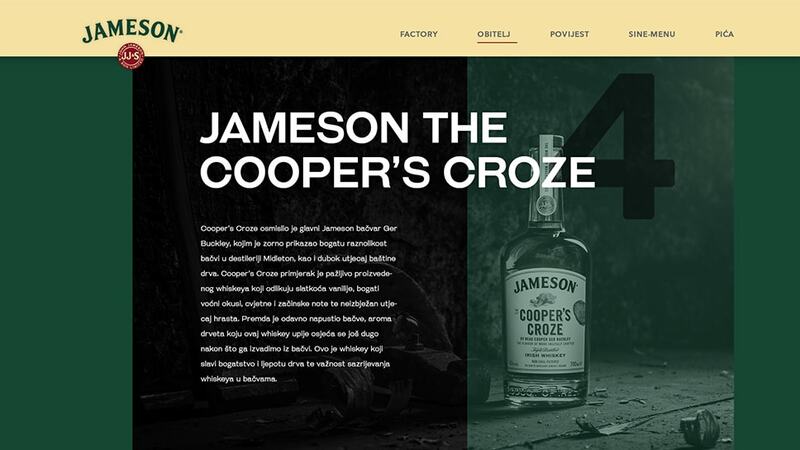 We created this landing page from ground zero according to guidelines our client briefed us with, their desires and needs, taking care of Jameson’s visual identity (official color palette, font etc.) to make it look similar to global Jameson website. 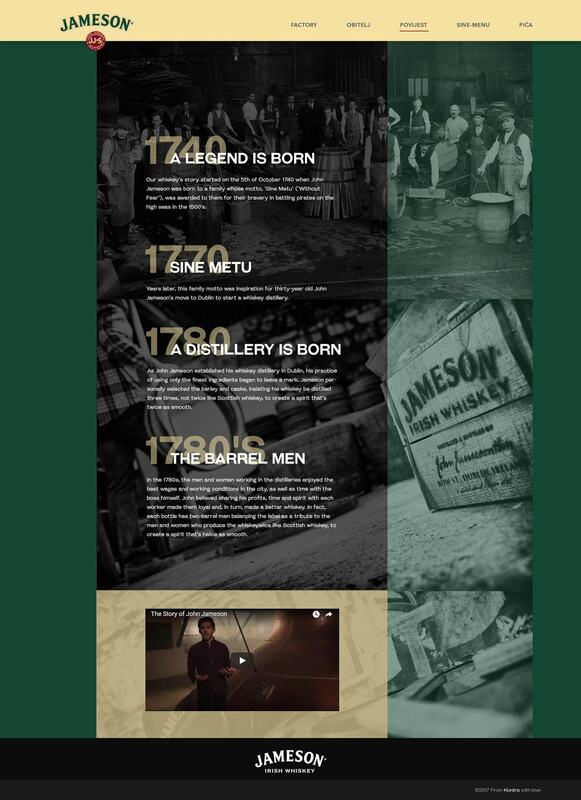 Since we used social media advertising to promote Jameson Factory event, all adverts contained link to this landing page. We knew people would be signing up for event on various platforms such as desktop, mobile, tablets and we payed extra attention to make sure page works on all operating systems and screens. "I’m glad I decided to develop SineMetu microsite with Kontra. 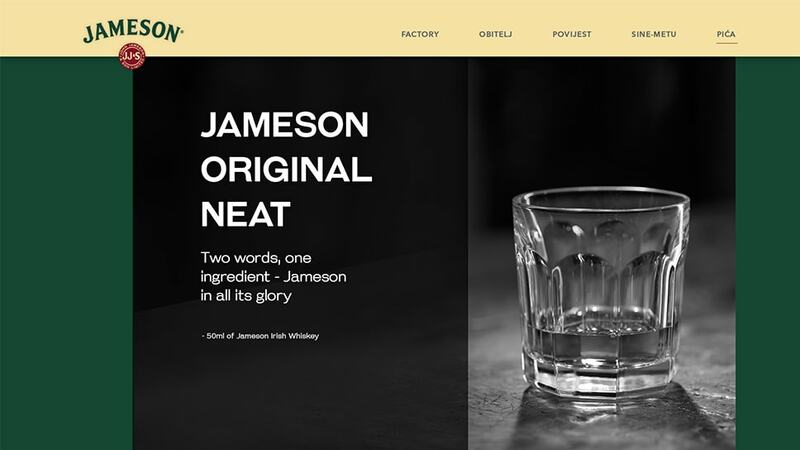 Your knowledge and professional approach helped us to run project smoothly and create great landing page, very important digital touchpoint for our Jameson Factory campaign."